After a small hiatus, Trey Burke has made his return to the NBA via Westchester. The former University of Michigan star point guard has made a splash for the NBA affiliate New York Knicks after being called up from the Westchester Knicks on January 14th. He began the season with Westchester after spending last season with the Washington Wizards. While Burke was with Westchester, he was an offensive force. He was the G-League’s second leading scorer, averaging 26.6 points per game and still managing to average 5.3 assists per game. Plus, his most standout performance was against the Delaware 87ers, when he single-handedly scored 43 points to lead Westchester to a close victory of 113-111. Coming off of the bench for the New York Knicks, Burke provided an instant spark that they seriously needed in every game that he has played in so far. He is particularly becoming known for stepping up his offense in the fourth quarter. 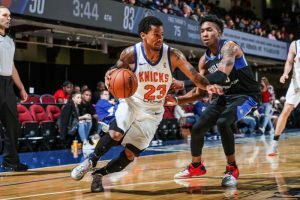 On January 26th, Burke scored 14 straight points in the fourth quarter against the Phoenix Suns to lead the Knicks to a 107-85 victory. Trey Burke is a natural scorer who has and will get better over time. Once he finds a team that will utilize his multiple skill sets effectively, he will flourish. The New York Knicks could be that team, as he is reunited with his former Michigan backcourt mate Tim Hardaway Jr. and builds chemistry with rookie point guard Frank Ntilikina. After being selected 9th overall in the 2013 NBA Draft by the Minnesota Timberwolves, Burke was traded on draft night to the Utah Jazz. He would spend the first three seasons of his NBA career with the Jazz as their point guard of the future. However, the Utah Jazz decided to move in a different direction in the 2016-17 season and traded him to the Wizards in 2016. Trey Burke was a highly touted point guard prospect out of Northland High School in Columbus, Ohio. He was Ohio’s Mr. Basketball in 2011 and a second-team Parade All-American.